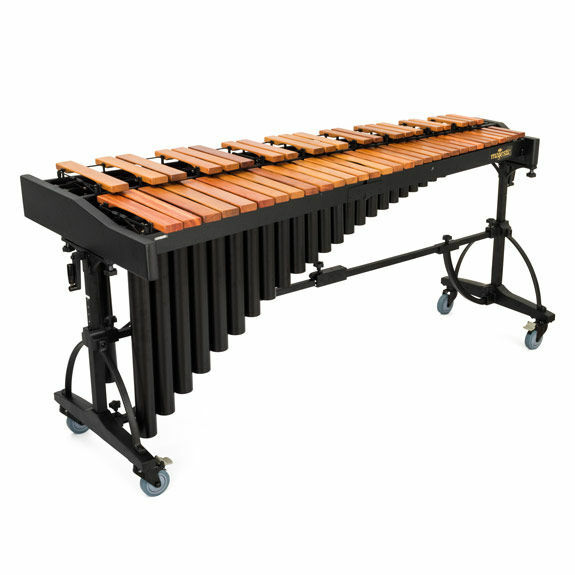 The Majestic 4.3 Octave Padouk Bar Marimba features an elegant concert leg system with hand cranks mounted high for easy height adjustment. Combined with offset arch resonators, these graceful frames offer a refined and professional look. Majestic Artist Alex Stopa performs "Red Rock Canyon" on a Majestic M6543D Padauk Marimba. Majestic Artist Alex Stopa performs "South Kolora" on a Majestic M6543D Padauk Marimba. It's hard to beat the "Majestic 4.3 Octave Padauk Marimba" for value and sound quality. In my opinion, padauk is a far better choice than any of the synthetic options available on the market. Although it's definitely NOT rosewood, the sound and feel of padauk is far closer to that of rosewood than a synthetic bar. For this reason I often recommend padauk marimbas to students who may be starting out, or to those who are on a budget. I'm really impressed by the quality of sound from this particular instrument, so much so that I've used it on professional gigs. PROS Padauk offers similar sound and feel to rosewood Graduated bars are similar in size to more expensive, professional instruments Set-up and tear-down is easy Value for money CONS None that I can think of! Let me start off by saying that I am anything but a marimba expert. I wish I were an expert at many things, including the marimba, but it naturally takes time and practice getting anywhere close to that. That's where getting this marimba steps in. I have had this instrument set up for a bit over a month now, and I am very happy about the purchase. It's certainly a nice looking student marimba. As far as appearance, the only complaint I might have is that this padouk version of the Majestic Deluxe instrument doesn't have as sleek of resonators as the synthetic and rosewood versions. Then again, since this is an instrument for me to be learning as a hobby... well, I guess that isn't really an issue. The padouk bars certainly are nice to look at, too. The frame seems fairly well thought out. I'm sure higher end ones are much nicer, but this feels solid. The cart does not have any manner of play to it, the end pieces and rails are fairly solid once the instrument is assembled. I also appreciate the simplicity of setup/teardown of the instrument. This is, fortunately, not something that I have an urgent need to do, but when I do need to move it, it is not a serious chore. I do wish, however, that Majestic had some manner of case, at least for the bars. I'm sure I can fashion something together when the time comes. Additionally, the hand-crank for height adjustment is super smooth and incredibly easy to work with. You can't ask for adjustments to be any easier. You really can't. I suppose the more important part of the instrument would be the sound. Well, again, I am no expert on marimbas. I have never had the fortune to play on anything other than kelon bars prior to owning this padouk Majestic marimba. I will say that the padouk sound is very satisfying. I can't speak to the durability of these padouk bars, but so far I am happy. The only slight quirk I am noticing with the sound of this instrument is on A2 and A#2, the furthest-left bars on either rail pair. I don't know if something is being muffled, if I have set something up slightly off, or it's just a physics thing with cheaper instruments, but the sustain is noticeably shorter on A2 and A#2. B2 and above are all great. The shortened decay does not affect much in context, but single, spaced-out notes on these two bars can stand out. Overall, this is a fantastic purchase. I have been having obscene amounts of fun diving into more marimba knowledge, working some pieces, and writing my own new material. I think this marimba is going to last me a pretty good run of time. I bought this marimba last week, and I'm very happy. It has a very beautiful sound, of course the sound it's kind different than the rosewood but for this incredible price it's excellent!! I recommend this product so much! !